When it comes to small homes and tiny houses, maximizing the usable space is of great importance in order to be able to have a functional home without lacking anything. Decoration options are quite limited for tiny homes from obvious reason. While we can all agree that tiny houses look adorable as they are due to the building style and their compact layout, adding personality requires careful planning. You don’t want to interrupt the perfect way in which all elements are set, so clearly large decorative items are off the table. But how about experimenting with lights? Lights obviously don’t take up a lot of space and they can perfectly fit in the vintage yet modern atmosphere that a tiny house has. So if you put away your Christmas lights, take them out because they might come in handy! There is something about bed drapes that can transform the entire bedroom into a serene haven. Drapes add a feel of coziness and suddenly laying down after a busy day becomes more pleasurable. Almost as if you are tucked away in your own private corner of the world. Adding fairy lights to the entire composition will add an additional wow-factor to your bedroom. Don’t worry about making strict patterns – attached some to the drapes, some to the ceiling and even let some hang loose. Perfection guaranteed! You can already imagine it, can’t you? Grab your Christmas lights (make sure they are not multi-colored!) or buy affordable fairy light with a good length and shape them into a word that describes you. Live? Love? Laugh? Dream? Smile? The choice is yours! Bearing in mind that we are talking about tiny houses, clearly having a full-size fire pit is too far of a stretch. However, the flameless fire pit doesn’t have to be a realistic impression in order to make a statement! If you have a nightstand, a shelf or a table that could use a bit of decoration, one such flameless fire pit can add a great personality to the entire room. All you need are some lights, a few sticks and a few stones (pun not intended). Arrange the stones in a circle and place the string lights in the middle. Make sure the light can reach the socket before anything else! Set the sticks up in a way they would mimic how a fire pit would look like. And there you go! If you want to invest more time, you can wrap the sticks in a tin foil and glue lace on top of it. Carefully cut the lace and tin foil open so you can get the stick out, arrange them and you have just created a really fancy fire pit! Mason jars have earned their reputation as irreplaceable DIY items that you can do a lot with. 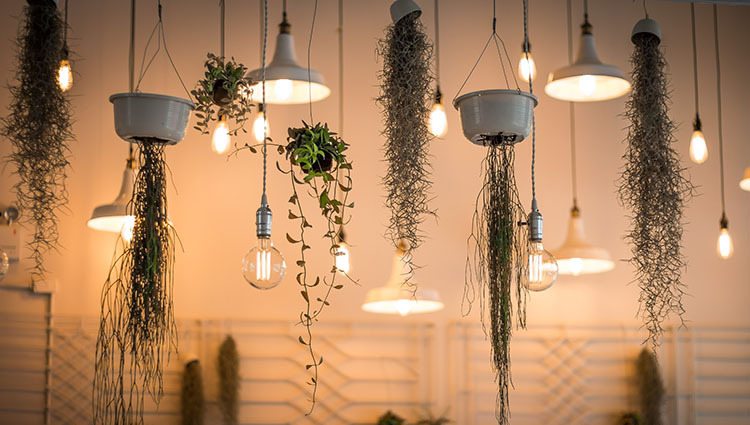 Why not combine them with fairy lights? This is a really simple decorating idea – just fill in the jars with fairy lights! Place them on a decorative plate on which you can add other items such as pine cones, fake flowers or plastic stars and you have made yourself a unique DIY decoration. Neon is making a strong comeback in many aspects of our living. It is present on the runways, on the streets and in home decoration magazines. If you are looking for a no-fuss, authentic vibe, neon lights can be a simple solution. Depending on where you are looking to put the neon sign and what you are trying to achieve with it, you can opt-in for different shapes, sizes and colors. Attach a neon sign on your wall and you will see the entire atmosphere of the room change. Neon lights can add a fun and unique tone to your home and they won’t take up a lot of space. If you have an empty wall, sparkling it up with fairy lights and pictures can be an easy fix that will look fabulous. Hammer few nails to the wall and drape your fairy lights by using the nails as support. Grab your favorite family photos (even better if you have polaroids!) and add them to the string lights by using clothespins! Not only it looks cool, but you suddenly don’t need frames to display pictures! Additionally, you can use an empty frame and drape the lights on the inside of it. In that way, you can even say your pictures are “framed”! Twine balls have dominated DIY websites for a long time now. They are simple decorations that look really cool. You can make them even cooler by adding lights. If you want to do this in the quick and easy way, buy twine balls of different sizes depending on the available space you have. If, on the other hand, you have more time on your hands and enjoy a bit of DIY, you can make the twine balls yourself. To do that, you need balloons, twine and all-in-one glue (Mod Podge). Blow the balloon to the needed size. Grab the twine and apply glue to it, then start wrapping it around the balloon. Let the glue dry and just pop the balloon! Take some fairy lights and add them on the inside of the twine balls and your Pinterest-worthy decorations are done! When it comes to tiny homes, big decorations are highly impractical simply because they can use up too much space. Instead, use your walls as your canvas that you can paint on with lights! Not only you will make your home sparkle in a literal way, but you will also spice it up with unique decorations that will not go unnoticed! This article was written by Lara Douglas, a young woman who loves interior designing and home decor. She is passionate about new trends and fashion forward home décor ideas. She regularly posts at Neon Signs Depot.